A lot’s been said about goal setting. Some things have become apparent as I’ve spoken with Marketing Managers. They have trouble articulating their company’s goals. Many companies don’t have goals at all, or at least senior leaders don’t share them with the rest of the company. Now that’s not a criticism of the marketing managers I’ve spoken with. Many are working so hard to do their jobs that there’s no time for anything else. Many wish they had that direction from their managers. Many don’t know how they fit into the puzzle. That’s why I wrote this blog. 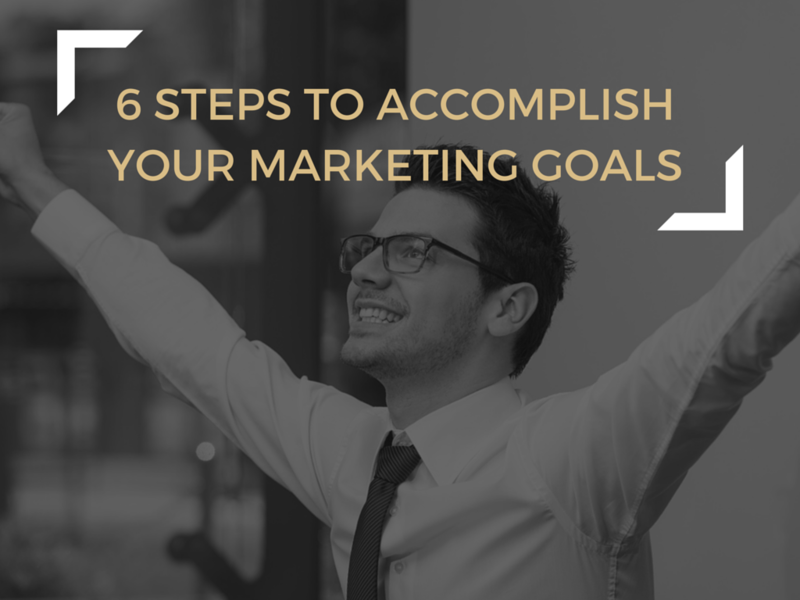 Here are six steps that will help the tired, overworked marketing manager accomplish their goals. My hope is that this will help create some dialog at your company and get everyone pointed in the right direction. Who should you share this blog with? I love this quote from Yogi Berra, because it’s the truth, isn’t it? The problem with not writing down your goals is that time passes, you put out fires, deal with staff issues, take a vacation or two, and when it’s time to reflect, you can’t remember exactly what the goal was. Actually putting the pen to paper is critical for succeeding. Some like to be formal about it — write a detailed narrative, print it, bind it and keep it handy. Others prefer the post it note that sits on the corner of the desk. Regardless of where you are on the continuum, write down your goals and you’ll hit them more often. Measurable – Commit to some real numbers that you have the capability to track and measure. Attainable – You know the limitations of your team, your time and your budget. You may need to get creative to reach the goal, but don’t stretch too far. Realistic – Goals have dependencies, and you have to set goals that can be reached. You probably aren’t going to double your revenue in a year if you grew by 3% last year. Timebound – Your goals should have specific milestones with dates to check progress. Are your goals structured this way? It’s one thing to set goals for you, your team and your department, but how often do you read them over and check your progress? Do they become a steering mechanism for your daily actions and plans? I like keeping my goals visible. As the owner of the business, I keep up with my “4 things.” I have 4 business goals at any given point in time, and I do my best to make sure everything that’s done in a day makes a contribution. The most important one is on a post it note on the wall beside my desk. When I look out of the window, I see it every day. How often are you reading your goals and making plans to accomplish them baby step by baby step? Everybody needs to be on the same “sheet of music.” One of the best pieces of advice I ever received in my career is that in order to reach a my goals for the business, everyone on the team needs to accomplish their goals. Those goals should “roll up” to mine. Working together — all contributing to the same goals — we make progress faster. Do you take time in staff meetings to discuss your goals? Are your employees excited that they help contribute to the success of the entire team? When you share progress toward a goal, it helps to orient the team. When you’re close to meeting the goal, it strengthens team morale. When you are falling short, it can motivate everyone to try harder or figure out a course correction. Depending on the timeline for your goals, consider discussing progress either monthly or quarterly. Are you taking time in your team meetings or one-on-one meetings to discuss goals? Are your team meetings too tactical? – Marissa Mayer, CEO of Yahoo! Even when you have a defined goal and a plan to accomplish it, your focus can waiver. In our business, we never know when a huge problem may pop up. A server goes down, the internet connection goes down, a client wants a meeting out of town, you have a campaign plan that’s due, your certification has expired… You get it — you deal with these things, too! One thing I find helpful is to carve out some time weekly to plan. Some weeks, the plan looks good. Other times, I realize we are behind and need to change things up. Dedicating time to that takes discipline, and sometimes late nights (after the family is in bed is the best, most productive time for me to plan). Are you disciplined enough to stick to the plan? Is your team devoted and bought into the plan? Do you know when to pivot? Is it time that you formalize some goals at your company? If you’re ready to start down that path, we’ve created a template to help you along your way. Click below to download it.